Create a focal point, add a bit of elegance or interject some whimsy into the garden with weeping trees and shrubs. 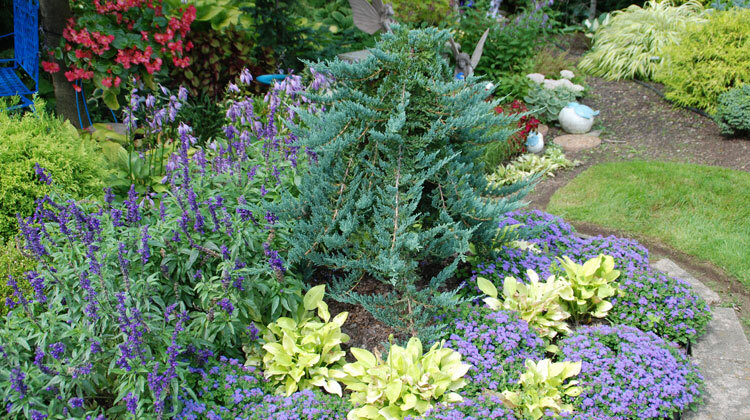 This blue rug juniper (Juniperus horizontalis ‘Wiltonii’ hardy in zones 3 to 9) was grafted onto a sturdy stem and elevated from sun loving groundcover into a weeping specimen. The steely blue foliage turns plum purple for winter. Grow the tree form of Russian cypress (Microbiota decussata hardy in zones 3 to 7) in sunny or shady garden locations. The lacy foliage turns coppery brown in winter. Another shade lover is weeping hemlock (Tsuga canadensis ‘Pendula’ hardy in zones 3 to 7). The horizontal layered branches form a mound of greenery that combines nicely with other shade loving plants. The Weeping European hornbeam (Carpinus betulus ‘Pendula’ hardy in zones 4 to 7) makes a shapely and graceful specimen in the landscape. The trees form, yellow to orange fall color and smooth gray bark provide year-round interest in the landscape. The slow growing purple-leaf weeping beech (Fagus sylvatica ‘Purpurea Pendula’ hardy in zones 4 to 7) is the perfect size for smaller scale landscapes. A bit more information: Angel Falls (Pinus strobus ‘Angel Falls’) is a slow growing weeping form of Eastern White Pine and hardy in zones 3 to 9. This tall narrow tree with yellow foliage makes a stunning focal point in the landscape.